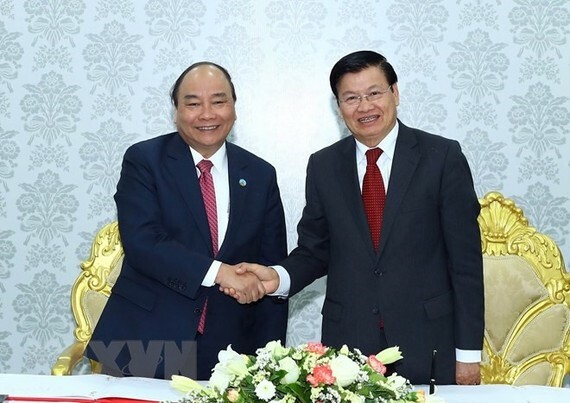 Prime Minister Nguyen Xuan Phuc and his Lao counterpart Thongloun Sisoulith co-chaired the 40th meeting of the Vietnam-Laos Inter-Governmental Committee in Vientiane, Laos yesterday. The Lao PM congratulated Vietnam on its socio-economic achievements in 2017 and showed his deep gratitude to the Party, State, Government and people of Vietnam for supporting Laos. He highlighted the significance of the committee’s 40th meeting, especially as the two countries completed the Laos-Vietnam, Vietnam-Laos Solidarity and Friendship Year 2017 and activities marking the 55th anniversary of their diplomatic ties and 40 years of the bilateral Treaty of Friendship and Cooperation. He expressed his belief that following the meeting the partnership between the two countries will be deepened and the traditional friendship between the two countries will be brought to a new height. PM Phuc expressed his delight at Laos’ achievements in the past year, saying that he believes the Party, State, Government and people of Laos will continue to successfully implement the resolution of the 10th Congress of the Lao People’s Revolutionary Party and the country’s socio-economic plan. He underlined that ties between Vietnam and Laos are special and need to be developed, affirming that Vietnam always attaches special importance to boosting relations with Laos, and will exert every efforts to enhance ties in all fields. In 2017, the two countries realised bilateral agreements efficiently, the leaders noted, adding that affiliation in politics, external relations, defence, security, economy, culture, society and people-to-people exchanges were also expanded. Vietnam currently hosts more than 14,000 Lao students. Meanwhile, mechanisms in coordinating and strengthening co-operation between the two sides were effective. Vietnamese enterprises have registered to invest in 411 projects worth about US$3.7 billion in Laos, 43 percent of which, or $1.6 billion, have been disbursed. In 2017, two-way trade exceeded $935 million, up nearly 13.6 percent from 2016, surpassing the yearly target. In 2018, the two sides will focus on implementing the joint statement and agreements reached by senior leaders, as well as deals between ministries, sectors and localities. They will double efforts to achieve 10 percent growth in two-way trade, while expanding collaboration in human resources training, investing in transport infrastructure projects to connect the two countries and coordinating in managing the sustainable use of water and natural resources. They will also co-operate with each other at regional and international organisations and forums. This is the second time the Vietnamese and Lao PMs have co-chaired a meeting of the bilateral Inter-Governmental Committee. After the meeting, the two PMs witnessed the signing of 12 co-operation documents between ministries, departments and localities in economics, trade, investment, education-training and energy. The documents include a deal on Vietnam-Laos co-operation plan in 2018 and the minutes of the 40th meeting of the Vietnam-Laos Intergovernmental Committee. The Vietnamese and Lao governments inked an agreement on investment co-operation to develop Vietnam’s Vung Ang Port. Vietnam’s Ministry of Industry and Trade and Laos’s Ministry of Energy and Mines inked a Memorandum of Understanding (MoU) on collaboration in energy and mining, while Vietnam’s Ministry of Education and Training and Laos’s Ministry of Education and Sports signed a bilateral co-operation plan in 2018. An agreement implementing the mineral survey and geological mapping project in Borikhamxay-Xaysomboun region was signed between Vietnam’s Ministry of Natural Resources and Environment and Laos’s Ministry of Energy and Mines. The Vietnamese northern province of Hoa Binh and the Lao eastern province of Houaphanh reached an agreement on the construction of a high school in Huameuang district, Houaphanh province. Military Zone 4 High Command of Vietnam People’s Army inked an agreement to run projects in Laos’s Xaysomboun province. Other documents include a MoU on the trade of electricity from the thermal power plant in Bualapha district, Khammouane province, between Laos’s power development and real estate company Lanxang and the Electricity of Vietnam (EVN); and another on the purchase of electricity from some hydropower projects of Laos’s Phongsapthavy Group between EVN and Phongsapthavy road-irrigation construction company. The PetroVietnam Power Corporation and the Lao PT company sealed a framework agreement on hydropower development in Luang Prabang, whilst Laos’s Chaleun Sekong company and Vietnam’s Song Da 5 company secured a co-operation deal on hydropower. After the signing ceremony, the Vietnamese and Lao government leaders chaired a joint press conference informing the outcomes of the 40th meeting of the Vietnam-Laos Intergovernmental Committee and attended a ceremony to honour units and individuals for contributions to Vietnam-Laos and Laos- Vietnam Year of Friendship and Solidarity in 2017.